Shibaura ISM Tier 4 Engine - meets EPA’s most stringent emission standards while delivering rated horsepower quietly with low vibration. Easy Open One-Piece Hood - provides accessibility for easy maintenance. Large Fuel Tank – 12.4 gallon capacity provides long operation times between fill ups. Synchro Shuttle Transmission – makes changing direction easier than competitive non-shuttle gear models. Fully synchronized 12 forward /12 reverse (XR3000 models) or the 16 forward /16 reverse (XR4000 models) gear transmission provides more operating speeds and easier, smoother shifting than others in its class for superior control, precision and safe operations for virtually any application. 3-point Hitch with Telescopic Lower Links Standard - category 1 with a hitch lift capacity up 2756 for XR4040C models lbs. allows easier attachment of a wide variety of implements. Drawbar Standard – increases the usefulness of the tractor without the additional optional cost. Extendable lower links-makes connecting implements easier. Optional Quick Attach, Skid Steer Compatible Front End Loader - remove or attach in moments. With 2500 lbs. of lift capacity for XR4040C, it outperforms others in its class. 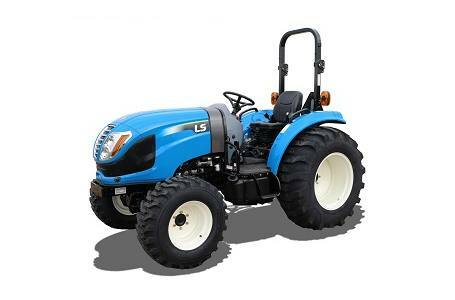 Grill guard comes standard with loader rather than an option like others in its class. Overall length with 3pt: 129.4"
Min. overall width with Ag tires: 62.4"
Height to top of Cab with Ag tires: 92"